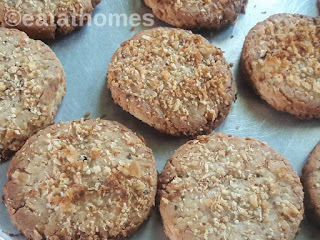 Whole Wheat Coconut Cookies– easy, quick, tasty and healthy cookie/biscuits recipe made with whole wheat flour & desiccated coconut. 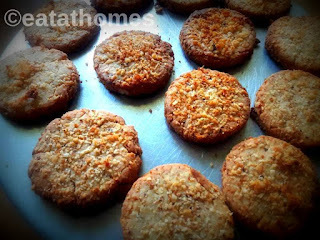 खोबऱ्याचे बिस्किट्स / coconut cookies is best for family gathering and kids tiffin box. it is very easy recipes. no need any preparation.just read the recipes and bake it. coconut coating is fully optional. (keep aside 1-2 tablespoon for coating) and bring it together. Add some milk if the mixture is too dry. Roll into balls and coat it with some coconut. Bake it in a preheated oven at 160 degree celsius for 18-20 minutes. Store them in airtight containers. Cane sugar can be replaced by normal sugar. You can even try it with jaggery syrup or jaggery powder. Coconut and jaggery is a wonderful combination. If you do not have dry coconut, use fresh grated coconut. You can even dry roast the grated coconut for 3-4 minutes. you can decorate the cookies with cherry or almond pieces.